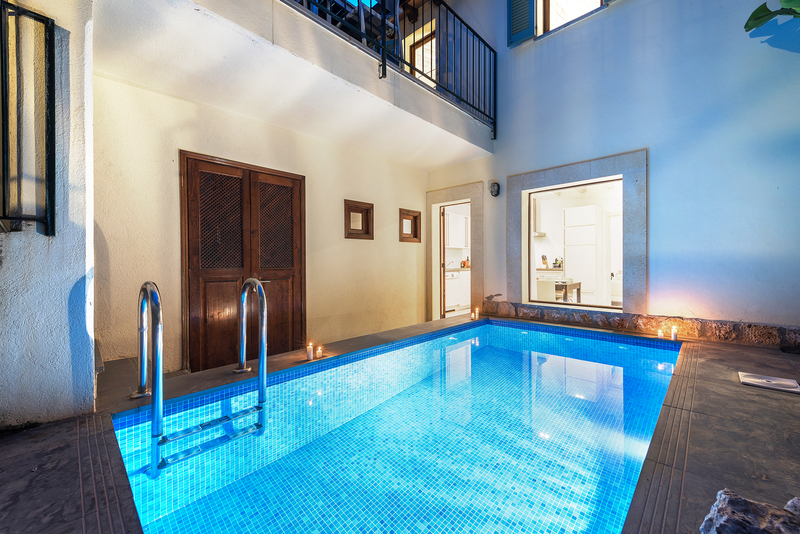 2 Bedroom, 2 Bathroom Town House with Mountain View and a Private Swimming Pool , Air Conditioning, WiFi, Satellite TV, near Golf, Sleeps a maximum of 4 people. 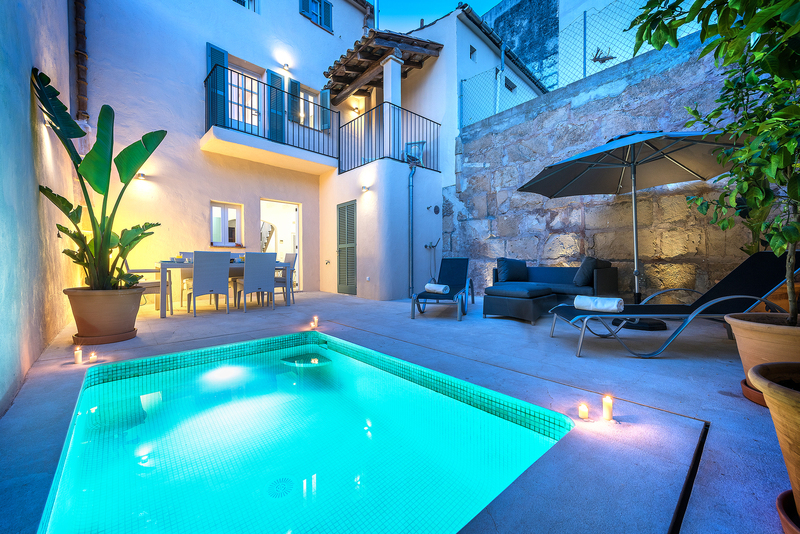 Casa Rocosa is a delightful townhouse situated high up overlooking the ancient town of Pollensa in northern Mallorca. 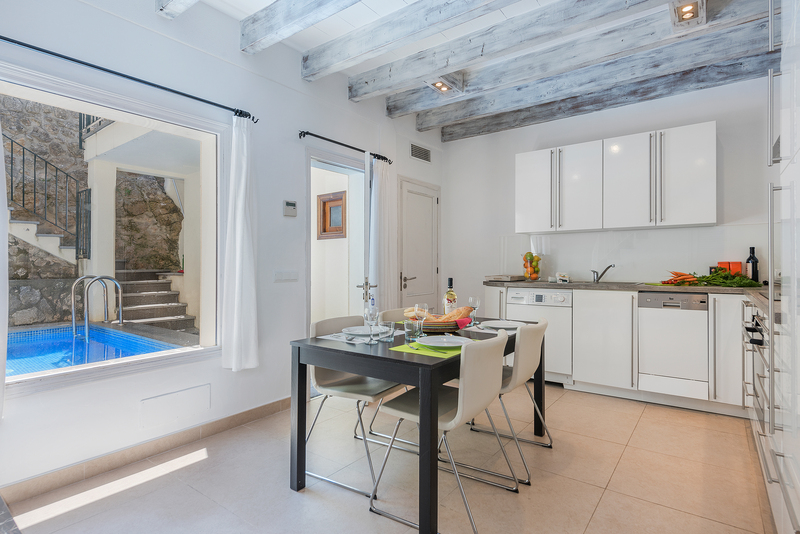 Completely refurbished to a high standard, as soon as you set eyes on Casa Rocosa you know you are going to enjoy your stay here so much. 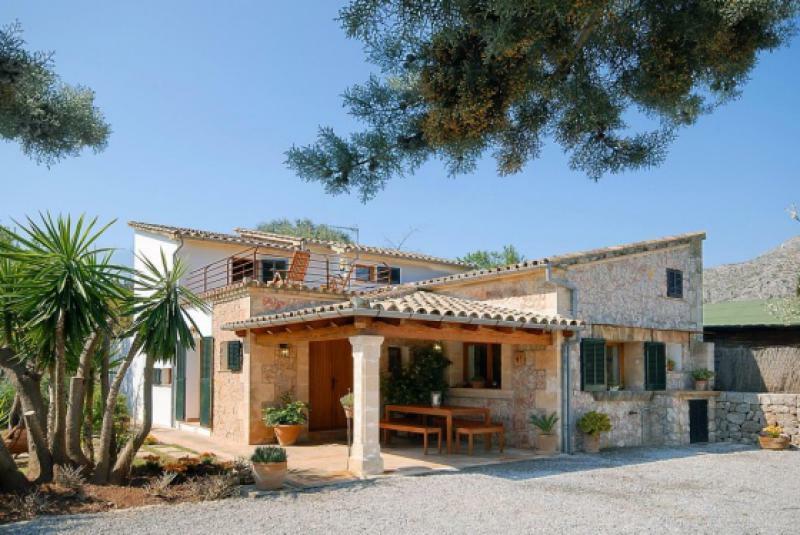 Two-storey Casa Rocosa nestles cosily in a quiet cul-de-sac offering all the peace and quiet you need. 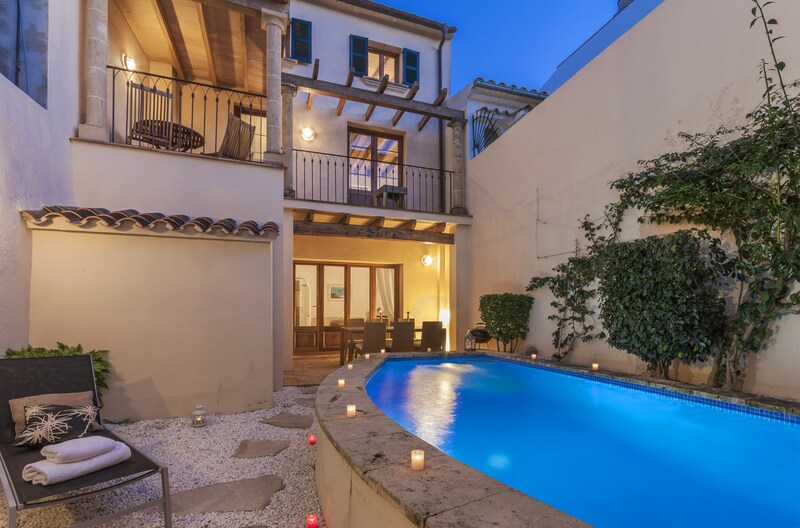 Constructed from traditional Mallorcan stone giving this beautiful townhouse strong hints of when an age of elegance in ruled in rustic Spain. 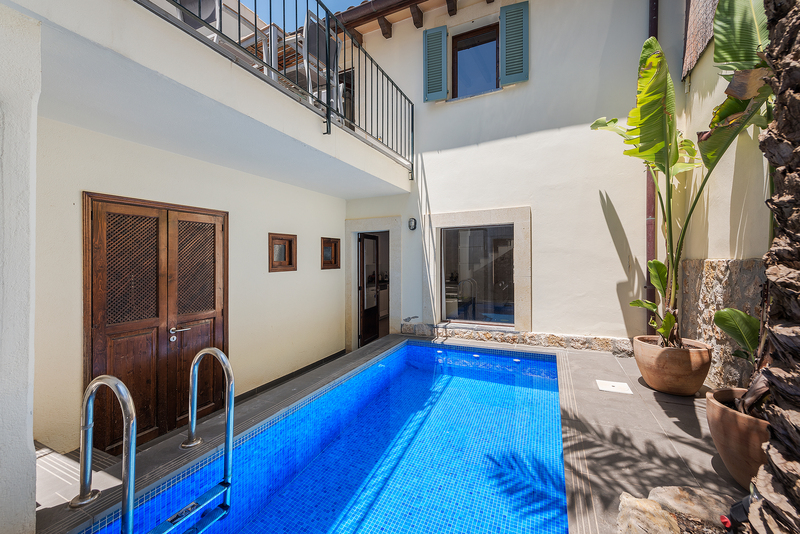 If the Mediterranean temperature rises, why not cool off in the delightful little private swimming pool further town the terrace? The views, once again, are fabulous. 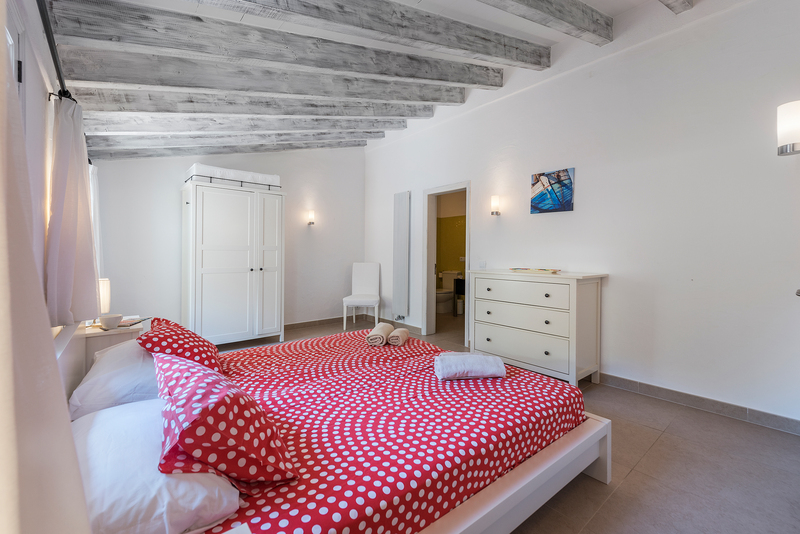 Casa Rocosa itself has been thoroughly modernised to provide the highest standards of comfort you would expect. 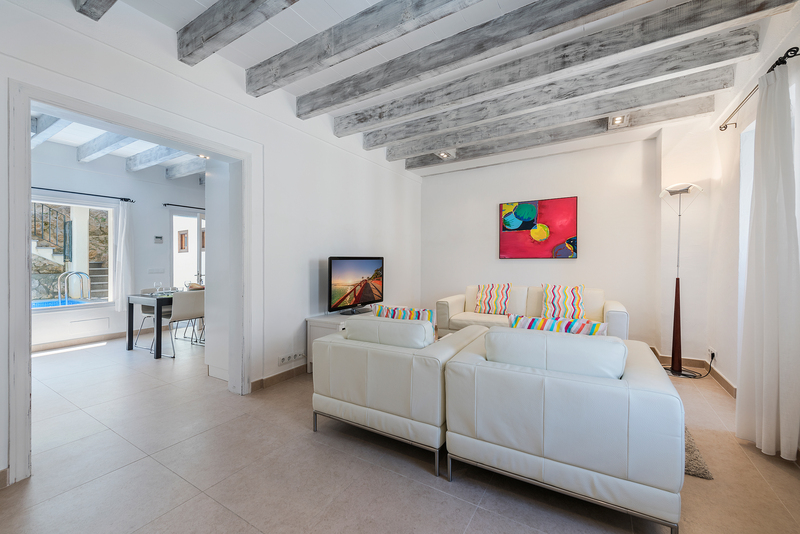 As soon as you walk into the property your eyes focus on the lovely blend of whitewashed walls and chic, exposed stone. The decor is rather easy on the eye too. 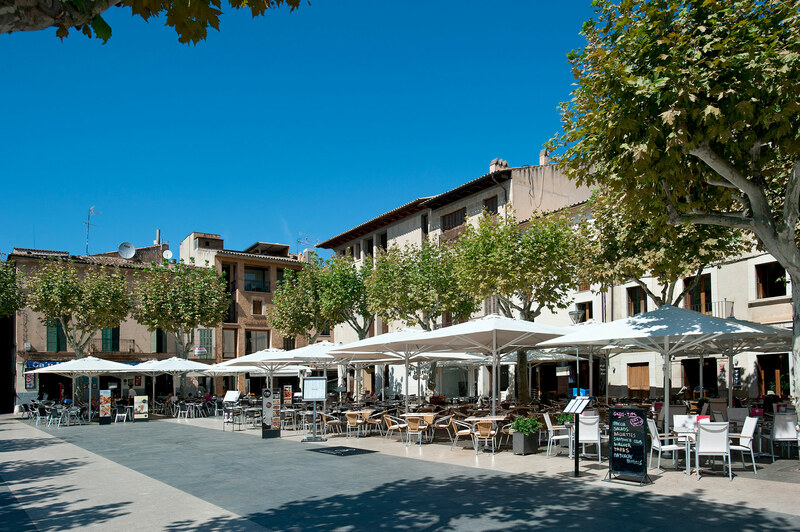 A contemporary fusion of cool black and white colours throughout are interspersed with splashes of colour provided by textiles hand-woven locally. Chic ceramics and gorgeous glassware add to the feeling of luxury. 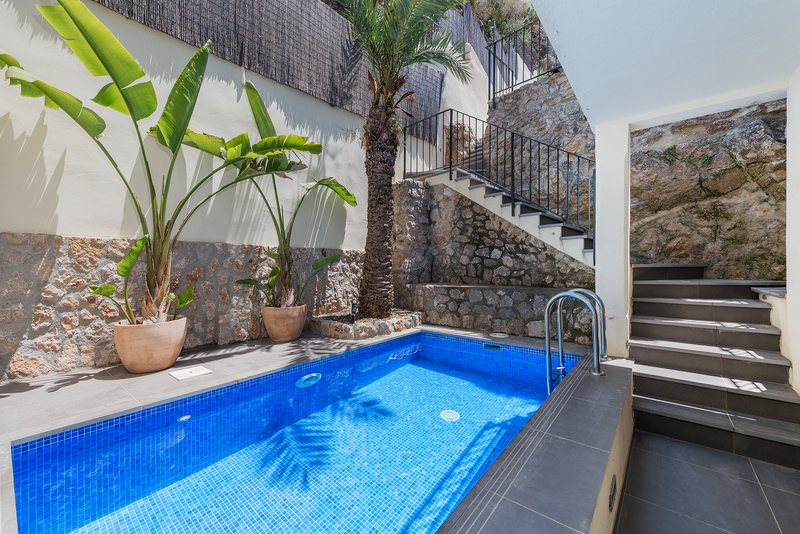 The house is air conditioned throughout, keeping you comfortable during the hot weather. If the temperature drops, simply put the central heating on! 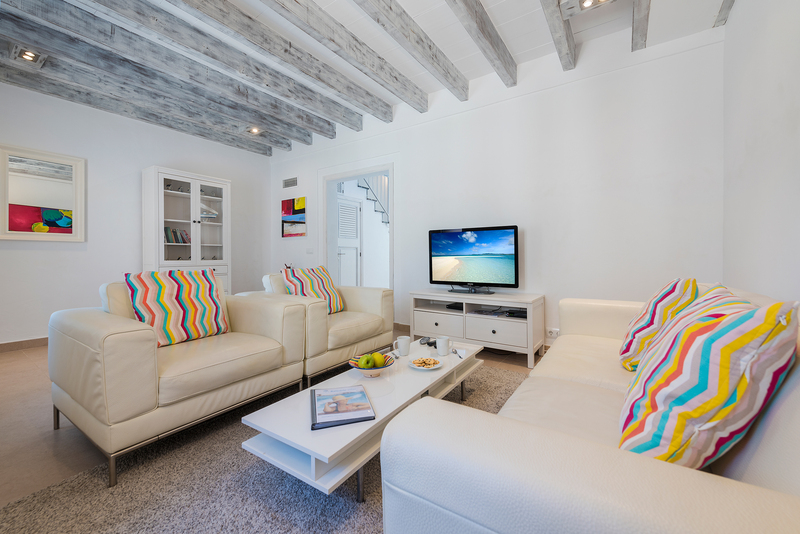 The star attraction on the ground floor is the beautifully appointed sitting room with lovely white designer furniture. 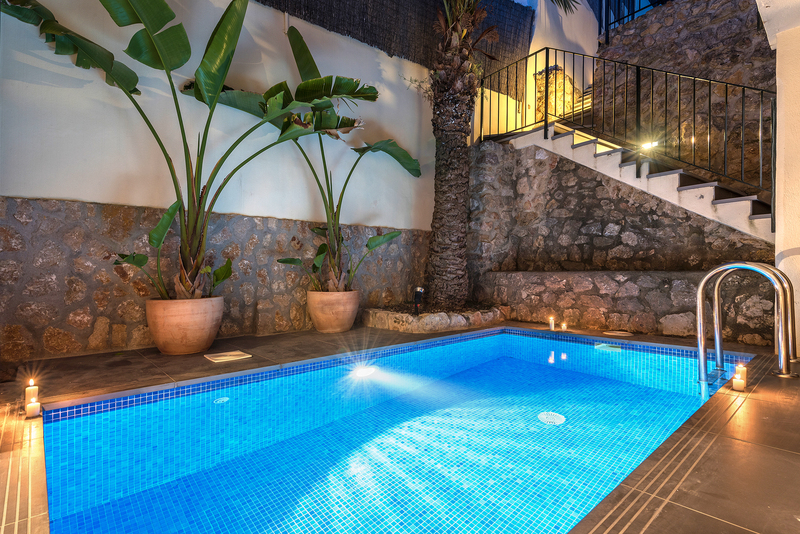 Here you can relax in front of the large satellite TV or simply log on via the WiFi connection. This sitting room leads through to the kitchen/dining room which is a lovely place to congregate at the dining table for an evening meal. 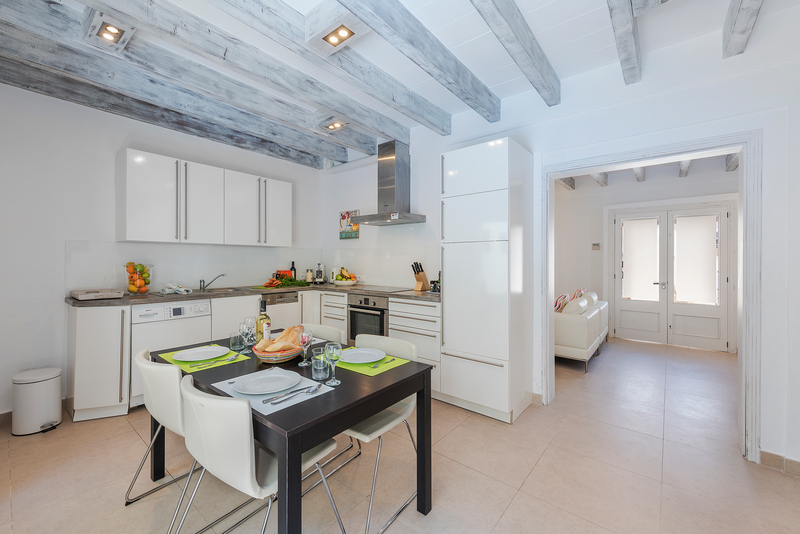 The kitchen naturally has all the latest appliances to make life easy. 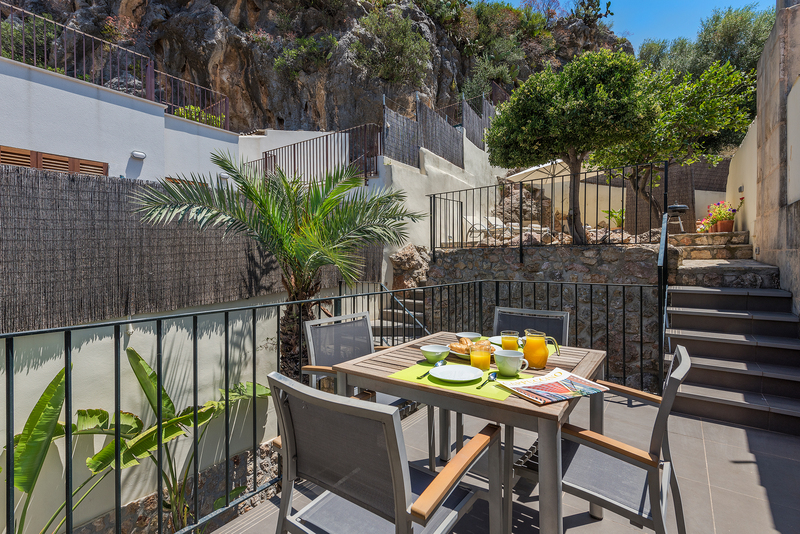 You could, of course, dine al fresco in the lovely garden if you wish! 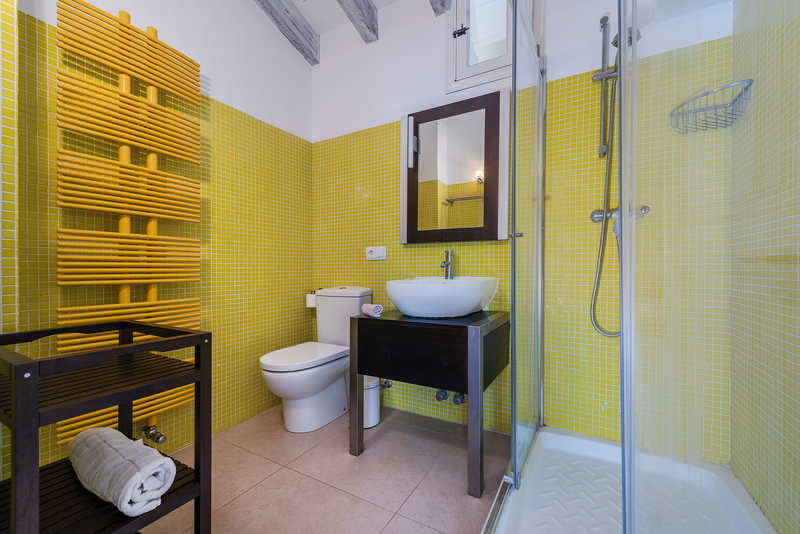 There is a downstairs loo with wash basin at Casa Rocosa, and upstairs guests benefit from two bedrooms, both featuring en suite bathrooms. 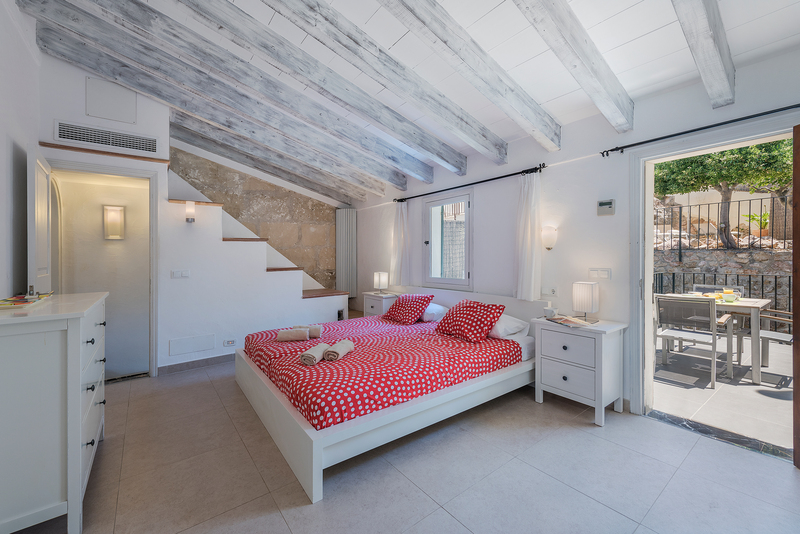 The large master bedroom is a delight. You`ll find a double bed, chest of drawers, armchair, wardrobe and writing bureau. 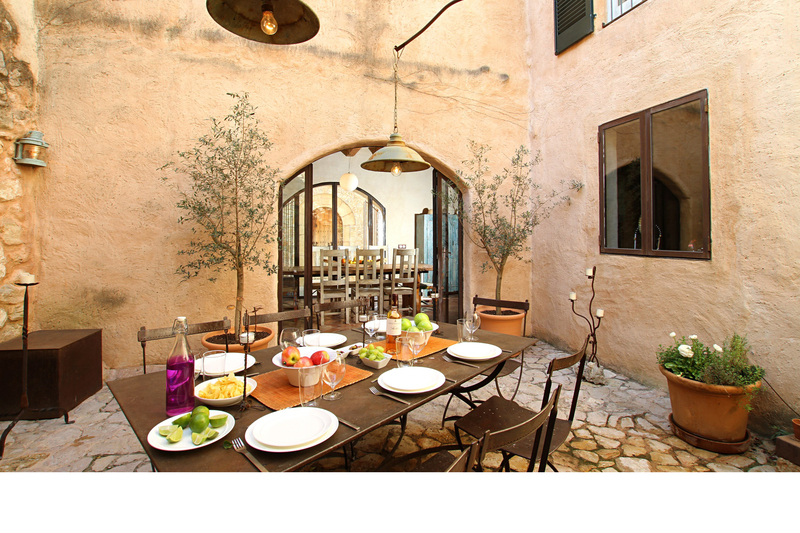 Here you have open access to the lovely sunny terrace which also leads to the garden. 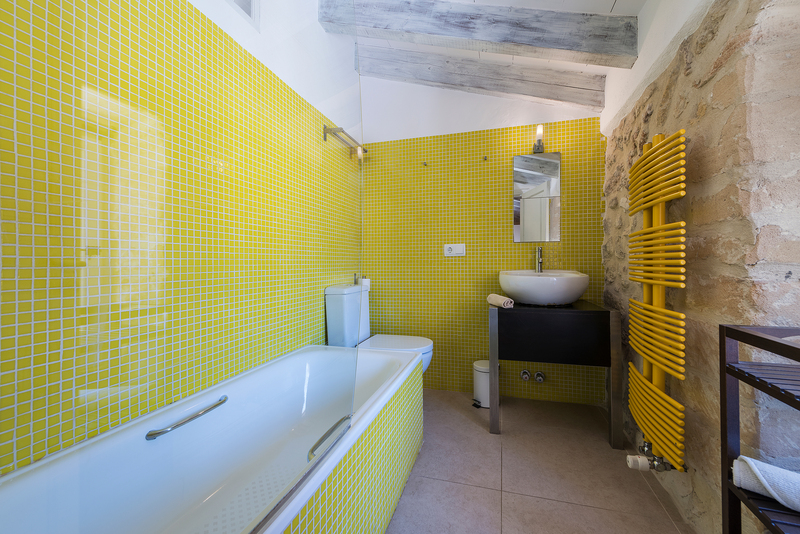 The en suite bathroom features a full-length shower. 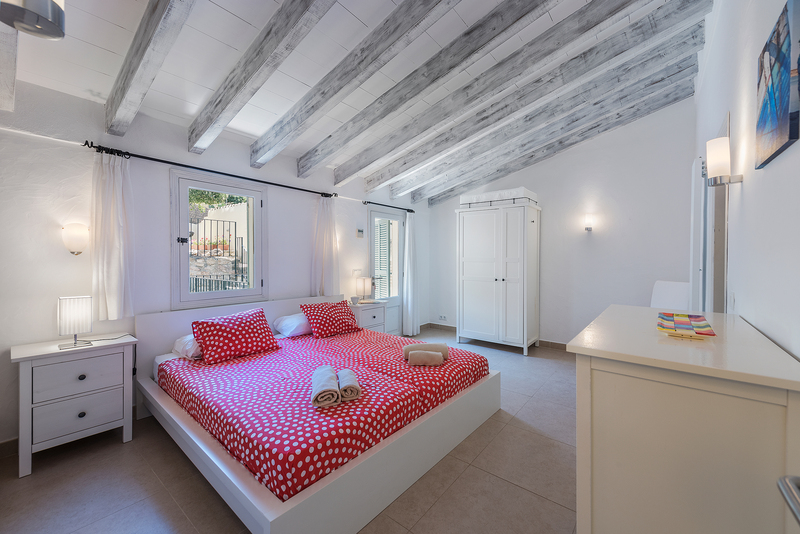 The second bedroom has twin beds, the en suite bathroom benefiting from both a bath and shower. 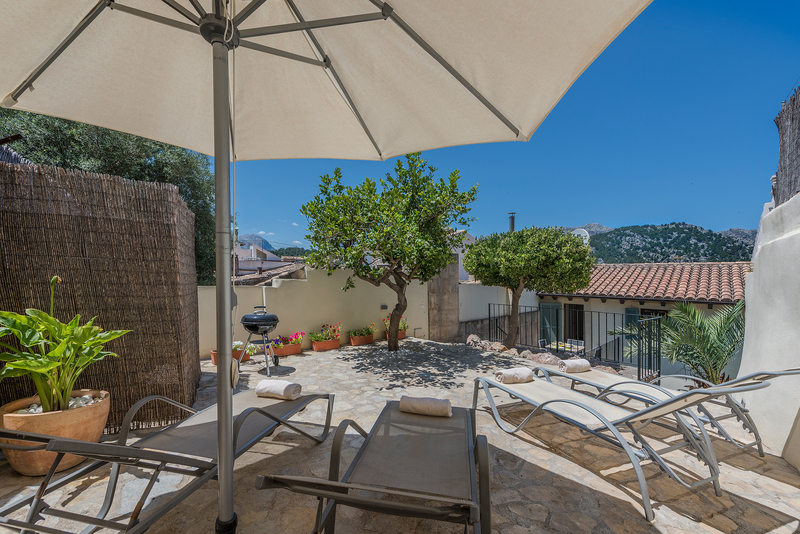 All in all, Casa Rocosa is a superb modernised traditional townhouse in historic Pollensa, one of Mallorca`s most attractive towns. There is on-street parking just outside the house. 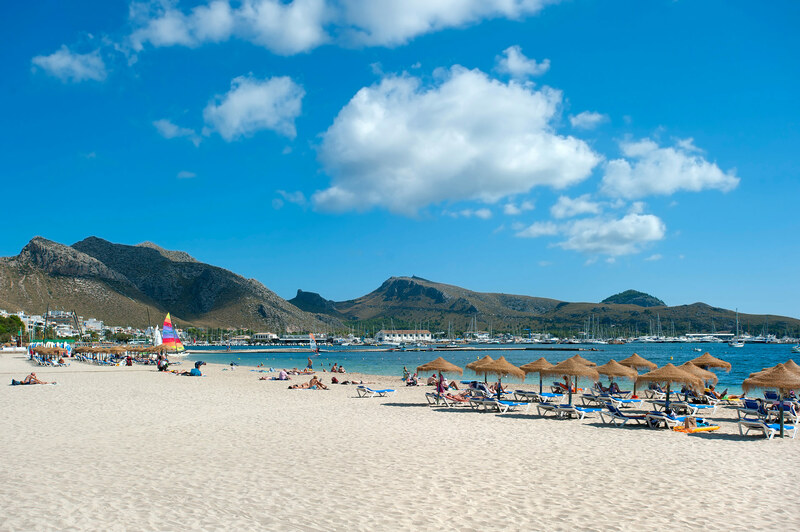 We strongly recommend early booking!